Fast & Free Same Day Shipping! Order in the next 00:00.00 for same day shipping! 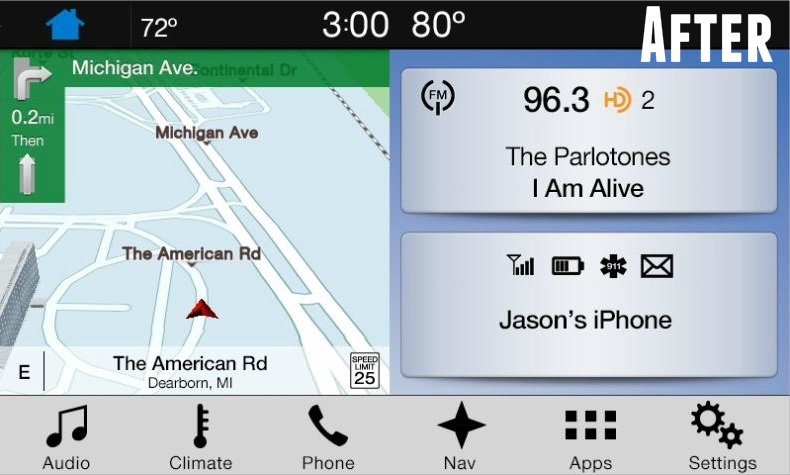 Use Google Maps, Waze or Apple Maps from your mobile device on the SYNC 3 screen. Our complete SYNC 3 retrofit kit contains genuine Ford parts, includes everything needed and comes pre-programmed. Please note, some of the pictures depict the kit with navigation - We offer this kit with and without factory navigation. It may also be depicted with on screen climate controls - this kit will retain existing on screen climate controls, but will not add them to a vehicle that did not have them before. Genuine Ford voice activated navigation system control module. Genuine Ford 8" Capacitive Touchscreen. Under dash, retrofit GPS antenna (Required - existing antenna NOT compatible). Full printed instructions & live technical support. A – No. There is not a cost effective way to add automatic climate control. A – No. SYNC Connect is a separate modem optioned in some vehicles. We do not currently offer a kit to add this functionality. A – No. This kit will not void your vehicle warranty. Although Ford will not warranty the components in our kit, we do for one full year! A – Yes. You will still be able to update SYNC via USB thumb drive from our software updates page HERE. A – No. SiriusXM subscriptions are NOT affected by our kit - your SiriusXM ID will remain the same. * Continental USA only. Must have a 2013+ production date, no physical damage and in working condition. See Policies for more info. **Regardless if your SYNC 2 system is navigation equipped or not, you will need to select "Navigation Version" option under "Kit Options" if you would like SYNC 3 to have navigation. This is a great upgrade to a 2015 Mustang. Install wasn't bad and well worth the effort. The video is great. I wish the kit included some dash clips, or I could buy them from the site and know they'll work. They are cheap, easy to replace, and you're bound to loose a few behind the dash. Not a big deal. Great upgrade. The components and instructional video are perfect. I took an iPad with me into the car and start/stopped on each step. Everything in the video is 100% accurate with no surprises. My only mistake was that I started the project without having a T-8 Torx bit. I had a Torx kit but not that small T-8 bit. I had to partially reassemble the dash and drive to a hardware store to purchase. Be sure to allow enough time so you are not rushed. Also, I was surprised on how hard you have to pull on the dash trim pieces to remove. I would not recommend doing this project without the 4Dtech dash trim removal tool set. Anything metal will likely scratch your trim. Upgrading to Sync 3 made me change my mind on trading in my vehicle. 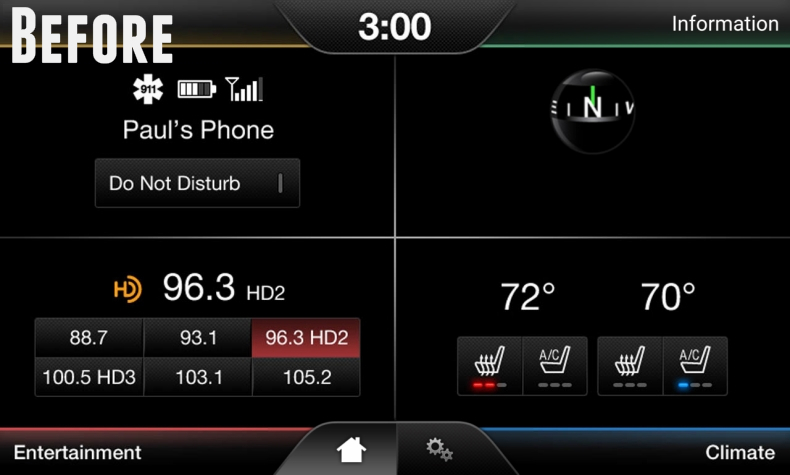 The Sync 3 screen works flawlessly and is soooo much better than the slow and cumbersome My Ford Touch unit. I put my iPad in the car with me for the install and just followed along with the installation video (which is great) on this website. Took me about 1 and 1/2 hours with no issues. It's a little expensive but if you have the spare cash for it, I'd highly recommend it to 2015 Mustang owners. On a side note, supposedly when Apple releases iOS 12 CarPlay will be able to display the Waze app which means there's really no reason to get the Sync 3 with navigation IMO. Great customer service and a great product. Very easy install with the help of the online video installation. The SYNC 3 Upgrade was a needed option that should have been on my Mustang. I went with the navigation package and I 'm glad I did. This thing is like night and day compared to my old non nav unit. The price is a little steep but hey I've spent well over a grand in all my cars to upgrade the radio. Not only do you get a faster cleaner looking operating system but my radio actually sounds much better too. Thats a fact too cuz my son has been driving mine for the last few days and he says the same thing. By the way he has a 2015 50th anniversary sync2 nav unit in his. Does make him a little jealous though! This unit plugged right I and works great... it’s night and day compared to the last sync unit. Very happy with this purchase. I went with the non-GPS version since I never used the GPS in my old one, instead opting for using my phone's GPS. Getting the main console dash off was a bit tricky and lost since clips. Will have to see if rattling becomes an issue over time. Like others have stated, you may have to take out the center speaker and you'll need torx screwdriver to remove the brackets from the old unit. I ended up having to make a run to AutoZone with my console in pieces to get one lol. The whole install took me just over two hours. Just be patient and it will all work out. Overall extremely pleased. I have the 50-year anniversary edition and finally fell that the display matches the rest of the car. The installation of this product, while somewhat challenging, was very straightforward thanks to the detail of the included instructions and the YouTube video. Removing the dashboard components was challenging, but it eventually came apart. Now that I have the SYNC 3 system in my dash I am very happy! The installation of the upgrade to Sync 3 could not have been easier. I used the video, watched each step, paused the video, and performed that step. Using the video was a lot easier than the written instructions. The only difference in the installation was with the GPS antenna. I had to use a different location and unscrew the speaker. There was already something at the spot where the video placed the GPS antenna and a cable was going down the hole where the video said to place the wire through to the unit. Also do not forget the trim removal tools. If you do not have them, you will need them to make the installation much easier. Once everything was installed and I started it up, all of my Sirius XM presets were still there, my Sirius Travel Link was recognized, and my climate settings were the same. The layout of Sync 3 is much better with the navigation map on the home screen. Also Sirius XM screen is much easier to use. One year from date of purchase. See our policy page for more details. © 2019 4D Tech, Inc | 4D Tech, Inc.